Heroes of Solitairea is rated 3.5 out of 5 by 22. Rated 5 out of 5 by upsysydaisy from Pleasant Difference I played the hour demo and really enjoyed the game. Being able to keep track of my score and earned money was a plus. Also liked the option of replaying a hand and the challenge of avoiding the skulls. The shop was pricey but just creates more incentive to carry on with higher scores to buy the items. The little dragon was cute but demo not enough time to reach peak potential. I own several solitaire games to provide relaxing fun as a break from the HOGs and TMs. I would buy this game with coupon or as Daily Deal. Rated 5 out of 5 by garfield60 from Great Hidden Object Game I really enjoyed playing this game. It was a lot of fun and it was challenging. I would recommend buying this game. Rated 5 out of 5 by katnap1 from An enjoyable game I really enjoyed this game and was sorry when it finished. I loved the music and the graphics were great. I had to replay a level or two but that was OK. An enjoyable game. Rated 5 out of 5 by cheryledz from LOVE IT!!! Love this solitaire game!! Baby dragon! Enjoyable! Got it on double punch Monday & don't regret it!!! Even the music is enjoyable!! 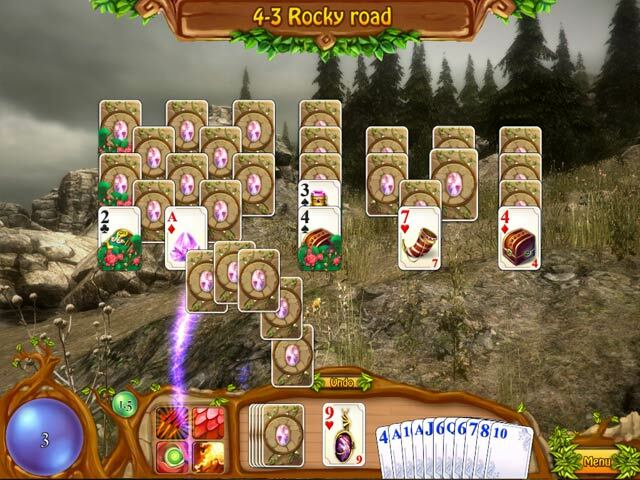 Great solitaire game!! The only thing I didn't like was that the cards could have been larger. Rated 5 out of 5 by mygames49 from ITS A WINNER ANOTHER GOOD CARD GAME. ITS WAS A VERY RELAXING GAME. Rated 5 out of 5 by pennmom36 from Help Save Solitairea! What a fun game of solitaire. You will hatch a baby dragon and nurture him, as he grows bigger and stronger he can help you destroy cards. As you complete each hand and earn gold, you will use that gold in the shop to "teach" your dragon lifelong skills such as destroying one card of your choice or 3 random cards. The goal of the game is to place cards that are higher or lower onto the main deck until hopefully all cards have been removed from the board. Some cards are encased in stone and you need to uncover the hammer to break the stone. You will also come across bonus cards that are number specific and you can use this card on the current hand or save for another, enjoy! 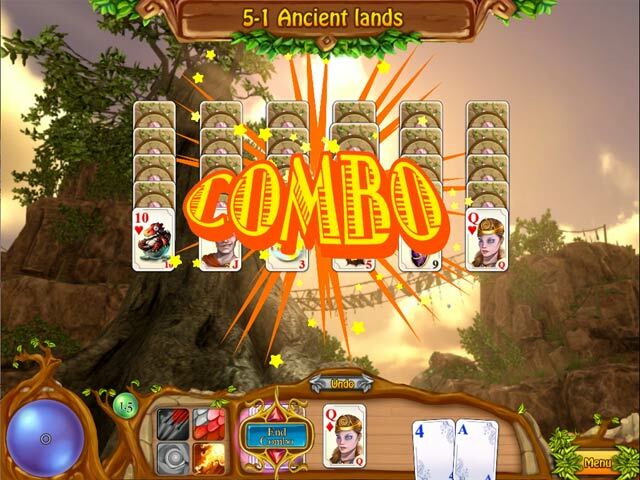 Rated 5 out of 5 by IsisRising from Another Hit In this solitaire game you have to grow your dragon and train him so that you can save your kingdom.There are many power ups that you can purchase as you progress.Game play is easy to understand and is basically like the other games by this group. Sounds are interesting and the music is not intrusive. You can turn either one down or off if you wish but for me they are fun. The art on the cards is good as with the other factors.I played for about 15 minutes before I purchased it. Rated 5 out of 5 by dachsy from Another Fine Solitaire Game Based on the demo, this looks to be another good solitaire game with a nice little story attached, and with plenty of challenge ahead. Nice colourful cards, which although a little on the small size, are nonetheless acceptable due to excellent graphics. Has the usual power-up cards (e.g. hammer card to break rocks) as in other solitaire games, but the method of deployment of such cards is rather different and innovative. You also have your friend the dragon to assist you and his power can be increased by equipping him with items you have bought with gold you have earned during play. I didn't quite get to the end of the first stage during demo as I got stuck on one hand. Beware, if you have too many failed hands in a row, you have to go back to the start of the stage again. Nice ambient music which changes with each hand. Colourful graphics, and backgrounds also look to be well done. 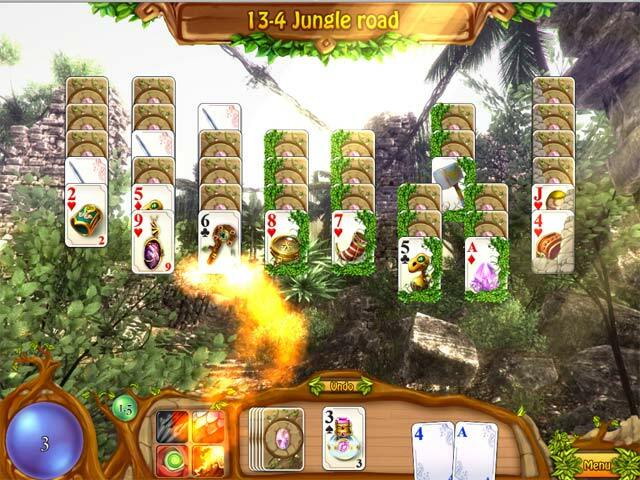 So, this looks to be an excellent solitaire with a good challenge level, which can be played at leisure as there does not appear to be any time constraints. 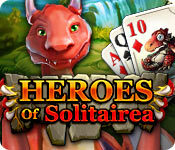 Embark on a journey across Solitairea with your dragon friend!